Need a Writer? Want to Collab? I write about the people behind the numbers and the routines and mindsets behind the success. 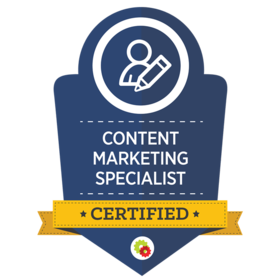 "Certified Content Marketing Specialists are uniquely qualified to help brands and businesses develop and execute a sustainable content marketing program. They are trained to create and measure engaging content at every stage of the marketing funnel, as well as leveraging organic and paid traffic to leverage content across the social web." I write for people first, search engines second. I treat each project uniquely and individually. I am a pro writer with over 5 years experience creating online content. Prices vary for projects depending on the topic, the level of research, if graphics and screenshots are required, etc. I want you to get the best content possible to meet and engage your audience. I commit to my work and I only work with clients who will do the same. By hiring me on a monthly basis you can rest knowing that your content marketing is happening saving you time and effort. You will no longer have to worry about flailing around in the online world like a fish out of water with no consistency and no strategy. Contact me and we can develop a custom monthly package to meet your content needs. You will receive regular and original blog posts that are keyword optimized and designed specifically for your target audience at regular intervals.